Need a hand, but don't want to spend an arm and a leg? Realistic skeleton parts strewn about make for chillingly creepy dungeon, crypt, cemetery and graveyard scenes. One-Pair Set includes both Right Hand and Left Hand. 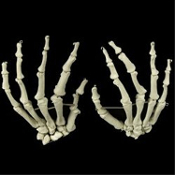 Each hand is approx 7.25-inches (18.13cm) long from below wrist to tip of longest finger. All of these Bucky hand bones are secured, wired together, and fully articulated.